This green juice is a Super Juice. Green vegetables contain chlorophyll, a plant substance that is very similar in structure to human blood. It is absorbed very easily by our bodies. Chlorophyll increases the red blood cell count and oxygen uptake in the blood, which increases our energy. It also helps to cleanse the blood of toxins, speeds up our healing process and gives the body a boost of nutrients. Cucumbers are natural diuretics that can cleanse the blood, purify the skin, and cool the body. 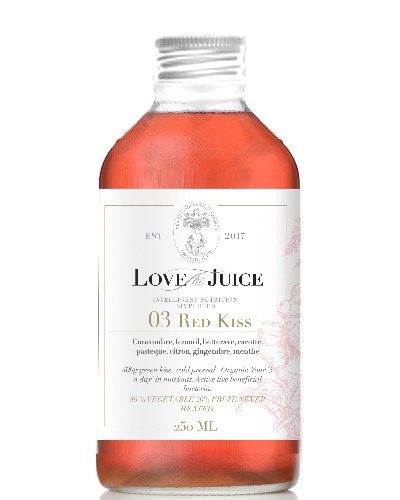 This juice is filled with powerful free radical antioxidants such as Vitamin C, Beta-carotene, Vitamin E, and Selenium. Fennel contains Unique Phytonutrients with Antioxidant and fantastic anti-inflammatory effects. It contains Potassium, Sodium, Vitamin A, C and B-6, Calcium, Iron and magnesium. Fennel also contains phosphorous, zinc, copper, manganese, selenium, niacin, pantothenic acid, folate, choline, beta-carotene, lutein, and zeaxanthin, vitamin E, and vitamin K.
The Ginger and Apple also help inflammation, aiding digestion, and improving circulation. The pectin in apples can help lower cholesterol LDL. The Celery helps the nervous system and liver work properly. Parsley, rich in vitamins and minerals, especially Vitamin C and Folate, can enhance your cardiovascular health. The Spinach and Lemon combine for more vitamin C than a typical glass of orange juice, while the naturally occurring Vitamin A and Beta carotene is essential for eye health. The high Vitamin K content will improve blood clotting and healing. The Chlorophyll and Lutein found in the Spinach are loaded with anti-oxidants that help boost your body’s free-radical fighting capacity. All the B vitamins from this juice will help to facilitate a healthy nervous system and improve carbohydrate metabolism for energy. Additionally, the rich Vitamin K, Magnesium, Calcium, Phosphorus, Copper and Protein content of the juice can improve bone health and help prevent osteoporosis. It’s a super food low in sugar. The Carrots in the juice provide the body with Biotin, Molybdenum, Potassium, Vitamins K, B1, B6, B2, C, and E, Manganese, Niacin, Panthothenic acid, Folate, Phosphorus, and Copper. They help treat and prevent diseases like cancer and diabetes and improve our vision, skin, hair, and nails. They also contain the strong immune fighting antixodiant, Beta carotene. Fennel contains unique Phytonutrients with Antioxidant and fantastic anti-inflammatory effects it contains Potassium, Sodium, Vitamin A, C and B-6, Calcium, Iron and magnesium. Fennel also contains phosphorous, zinc, copper, manganese, selenium, niacin, pantothenic acid, folate, choline, beta-carotene, lutein, and zeaxanthin, vitamin E, and vitamin K.
The anti-oxidant rich sweet tasting pineapple contain anti-inflammatory factors that naturally reduce inflammation. In fact, pineapple contains bromelain enzyme that can strongly reduces inflammation, assists in healing, and improves digestion. The Lemon provides extra Vitamin C to help bring alleviate inflammation and boost the immune system. Curcumin is the active ingredient in turmeric, and it has powerful biological properties. Ayurvedic medicine, a traditional Indian system of treatment, recommends turmeric for a variety of health conditions. These include inflammation and chronic pain. Western medicine has begun to study turmeric as a pain reliever and healing agent. Organic: Cucumber, Fennel, Beetroot, Carrot, Watermelon, Lemon, Ginger, Mint and Ganeden BC 30*. This juice is great combination of fruit and root vegetables that all aid in MAKING a better version of you. The beetroot is thought to help with circulation and may lower blood pressure. Researchers found that people who drank 8 ounces of beetroot juice daily lowered both systolic and diastolic blood pressure. Nitrates, compounds in beetroot juice that convert into nitric acid in the blood and help widen and relax blood vessels, are thought to be the cause. Beetroots get their rich colour from Betalaines. 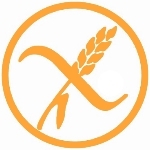 Betalaines are water-soluble antioxidants. According to a 2014 study, betalaines have chemo-preventive abilities against some cancer cell lines. Betalaines are thought to be free radical scavengers that help find and destroy unstable cells in the body. They help inflammation, improve endurance and energy. Beetroot is rich in Potassium but also a good source of: Calcium, Iron, Magnesium, Manganese, Phosphorous and Sodium. The Lemon provides extra Vitamin C to help bring alleviate inflammation and boost the immune system. The addition of Ginger gives the juice a nice kick and helps decrease inflammation, improve digestion, and enhance circulation. 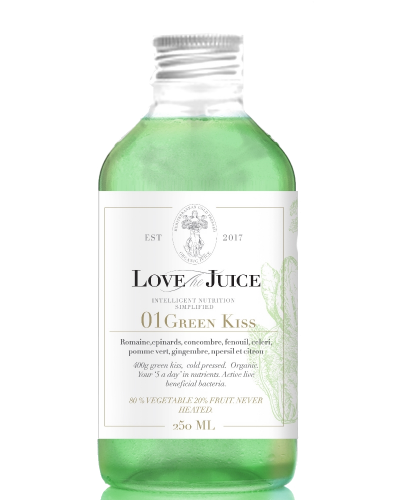 This Red KISS also contains Cucumber and Fennel with all those same health benefits listed above in our Green KISS. 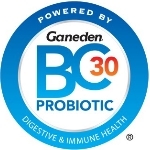 *Ganeden BC 30 is an amazing probiotic ingredient that is used in foods and drinks. 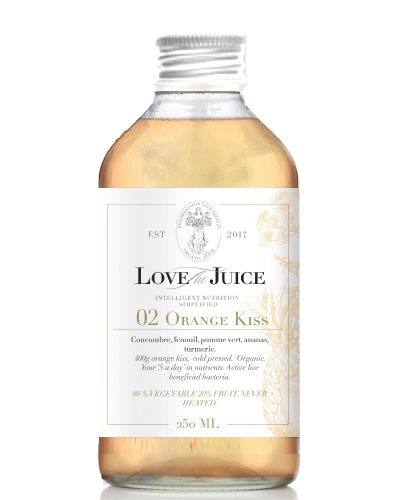 We took 12 months to create 3 blends which allow you to drink the rainbow and with that and lots of love, patience, care, and knowledge, you have a juice that not only tastes good but is good for you.